Image and concept Copyright Margaret Ann Howard 2018. ​Sorry! Dream Journals are currently sold out! This gorgeous object is my handmade, hand letterpressed, blank dream journal. Paper is unlined so that you can draw dream images, too. I designed them to be helpful, as well as beautiful. Levels of consciousness on the front cover, and simplified instructions for writing down dreams as the back cover, all expressed in the wonderful drawings of St. Louis artist Caitlin Metz. ​This Dream Journal is a pleasure to hold. It is a hand bound, hand letterpress dream journal of my own design concept, created for you to have a wonderful and worthy space for the writing down of your dreams, to hold your dreams gently and respectfully. 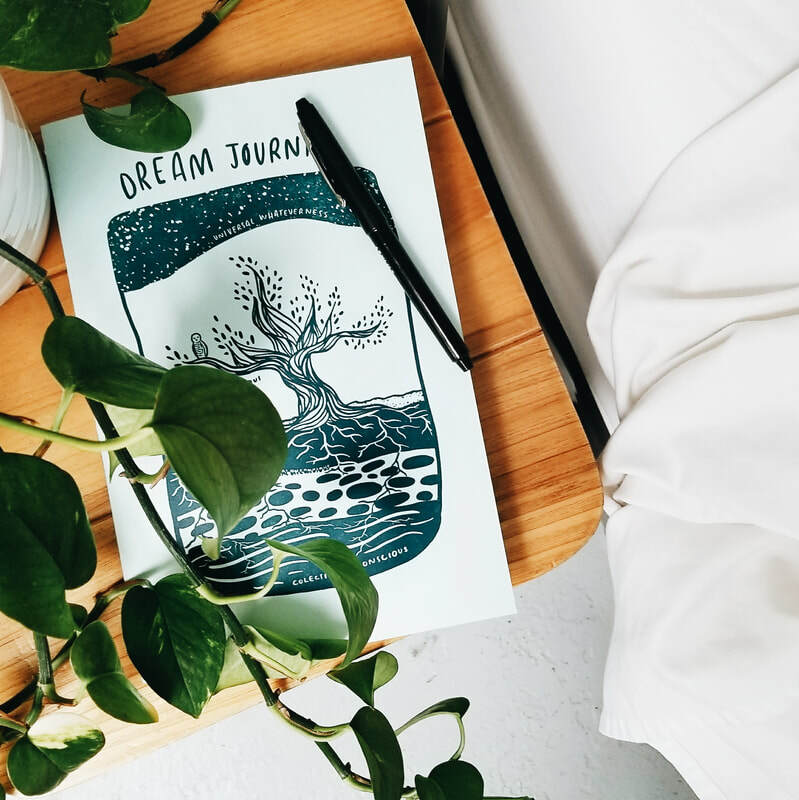 Writing down your dreams is an deep and ancient practice, and it can glean great rewards. Studies have shown that writing down our dreams increases our memory of them. These tips for remembering dreams are pretty much what I recommend to clients. Image of the Wild Woman Archetype on the back cover, which appears on this web site in another form, was created by the young artist Pearl, who is the daughter of beloved friends and was 10 years old when she drew it; Pearl receives a residual for each journal; Caitlin adapted Pearl's Wild Woman on the Dream Journals for the one-color press. ​These journals are made using environmentally friendly materials. Sorry! Dream Journals are currently sold out! Email me if you want to order more than one journal, please. I'll figure out shipping and then send you an invoice. If you want to use Cash App just email me and we'll make it happen. *This rate is within the continental US, my cost for envelope and Parcel Post USPS with tracking. I will check shipping for your zip code and let you know if it's different. Expedited shipping is extra, based on cost. ​Inquire for international shipping rate. Journal is light blue, with dark blue ink. The front represents the levels of consciousness. The back is simple instructions for writing down your dreams in a way that works well for Jungian-influenced dream work. See my Dreamwork Page for more about the healing power of dreamwork.